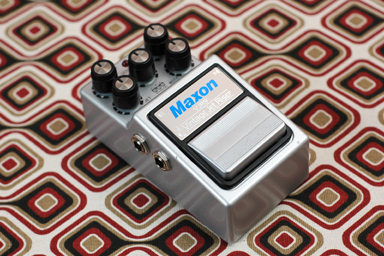 Inspired by vintage effects such as the Ibanez Flying Pan and Jetlyzer, (both of which Maxon originally designed), ADA Final Phase, and the Roland Jet Phaser, the Maxon VJR-9 Vintage Jet Riser offers a modern take on those swirling, streaking, psychedelic sounds of the 70’s. Employing a newly-developed sound generator, the VJR-9 creates a more realistic “Jet” effect using a voltage-controlled-amplifier and voltage-controlled-filter to create the effect. This Jet signal is mixed with the input signal and then passed along to an analog flanger circuit based around Maxon‘s proprietary MC4107D bucket brigade device. With the VJR-9 a wide range of useful effects are possible, from shimmering chorus to jet-plane flanging. Many new and unique sounds are also attainable, such as auto-filter/tremolo, Space Driving, and Jet-Slap Bass (see audio clips for examples). Using an external footswitch (sold separately), the Jet effect can be turned on and off, allowing the user to toggle between straight flanging and Jet sounds. The VJR-9 features the same RMS noise reduction circuitry found in Maxon‘s popular AD-9 Pro Analog Delay. With the VJR-9, clean flanging without distortion is available with increased headroom, allowing use with high-output pickups and active electronics. The VJR-9 also employs a DC/DC converter circuit and internal voltage stabilization. These circuits allow it to operate at a stable and continuous 9 VDC, regardless of battery voltage drop or fluctuation of AC power source, resulting in more consistent tone and reliable operation. The VJR-9 can also be used in an amplifier effects loop (+4 dB/-20dB) as well as in the amp’s front end. The VJR-9 comes complete with the new Maxon AC2009 power supply. The AC2009 provides very consistent high current that is regulated and filtered to provide stable, noise-free power to the VJR’scircuit. The AC2009 is auto-sensing, so it can be used anywhere in the world by simply changing out the detachable plug cord on the output side of the PSU. Like all Maxon 9-Series effects, the VJR-9 features True Bypass switching using a mechanical 4PDT low-noise switch. The Maxon VJR-9 Vintage Jet Riser – the sky is no longer the limit!